Savute is a region that undergoes dramatic changes to its environment at unpredictable intervals. This is due to geological activity that once occured in the region. Savute Marsh is fed the Savuti Channel which drains the Linyanti swamp to the North. What Attracts Wildlife to Savute? The Savute region has undergone dramatic changes in recent years - once a dry season haven for a multitude of wildlife, now the Savute is where the animals migrate to during the wet summer months to feed on the lush grasses of the marsh. The area is the scene of one of Africa's last great land migrations. With the coming of the rains, thousands of Zebra move from the northern regions of Chobe and Linyanti into the lush grasses of the marsh. As in many parts of Africa, Savute has a wet and a dry season, but unlike many other places, the game does not disperse during the wet season. In fact, it congregates on the marsh and floodplain. With the first rains, the grass sprouts in a few days and it is this that attracts the herds of Zebra and other animals into the region. They will spend some months in the area before moving back north to the permanent waters when the grass withers and the surface water dries up. Elephants can usually be seen in the Savuti area, and hundreds of bull Elephants winter in the area. It is not unusual to see 50 plus of these gentle creatures at a waterhole at any one time. During the dry winter months breeding herds of Elephants are a rarity in Savute due to the lack of water, but in the wet summer months they move into the area. In the years when the Savuti Channel dried up; there was a group of around 30 Lions that took to hunting adolescent Elephants. Now that the Savuti Channel is flowing the pride has split into smaller prides and hunts easier prey. This was also the area where a film documenting the interaction, or war between Lions and Hyenas was filmed. Many Zebra migrate to the grasslands of the Savuti Channel in the summer months when other food is scarce and the grasses of the floodplains are fed by the local rains. This is a much smaller Zebra migration than the migration between the Okavango and the Makgadikgadi. 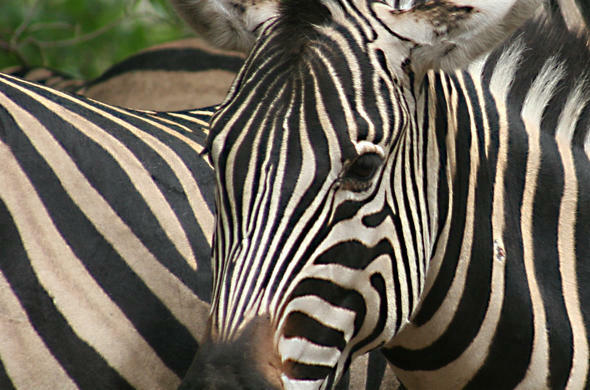 They usually pass back through the area in spring and the Zebras are giving birth. The young Zebra foals are easy prey for the regions many predators. Impala are red-brown, medium sized antelope which are common in the Savuti region. There are small resident herds, but many migrate into the region in summer to feed on the fresh green grasses that are rich in nutrients. However being browsers as well they can also feed on the leaves of shrubs which help them flourish in regions where grazers might not find as much food. Now that the channel is flowing again, it provides an important water source for these animals during the dry winter months. These large antelope are often found along the river as they need to be close to the river. They will often seek the shade of the Mopane forests during the heat of the day. They are more common in the Okavango, but you can see them around the Savuti area. One of Africa's Big Five they are known to be very dangerous when wounded or surprised. These hulking animals can be considered the cattle of the bush. Large herds of Buffalo are often found on the abundant floodplains of the Savute Marsh. They are the favourite prey of Lions, and the prides are never too far from the Buffalo herds. 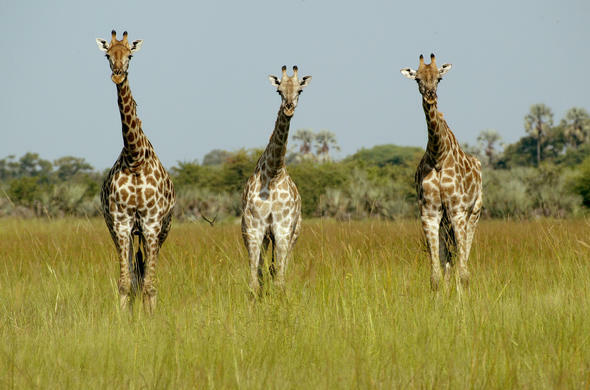 In the areas of the Savuti where there are tracts of Acacia trees you are likely to come across Giraffe. The world's tallest animal, these animals feed exclusively on these species of trees. They do not need to drink often and can be found in quite arid areas. These animals also migrate to feed on the lush grasslands of the Savuti, and head through on their way to the Savuti Channel or Linyanti River in search of water in the dry winter months. They are reliant on these sources of water to survive the dry season. 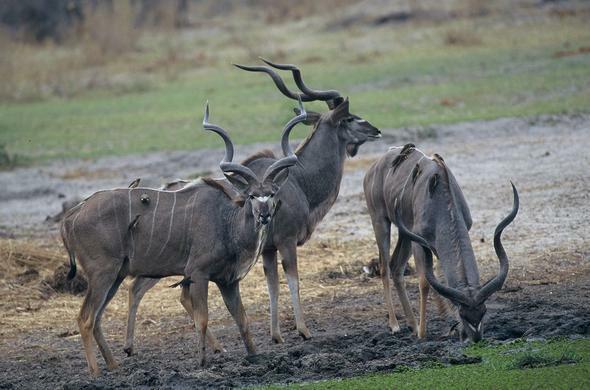 Kudu are one of the most distinctive of the African antelope; they are a dusty brown and have long twisted horns and white stripes along their sides. They are usually found in the Mopane Woodland, though you will also see them come down to the Savuti Channel and the Linyanti to drink.